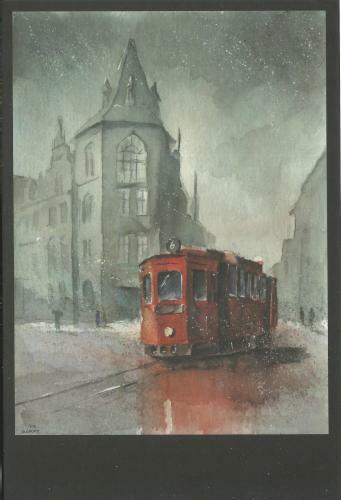 Postcard BE-427724 from Belgium shows one of Grzegorz Chudy's paintings By Tram through Old Chorzów published by Postallove. Chorzów is a city with 2 million residents in Silesia in southern Poland, near Katowice, on the Rawa River which is a tributary of the Vistula. Grzegorz Chudy, born in Katowice and known for his watercolor paintings, is a teacher of Polish literature and Silesian language.